The Capay Valley Almond Festival is back or its 103rd year on Sunday, February 25th, from 7:00 a.m. to 5 p.m. 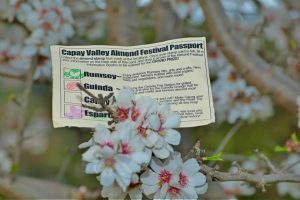 This unique “travelling” festival takes place across five Capay Valley communities – Esparto, Capay, Brooks, Guinda and Rumsey – in celebration of one of Yolo County’s top crops, the almond. With a wide variety of interactive activities, live music performances, food and drink vendors, arts and crafts sales, and more, this one-of-a-kind event is sure to be an exciting outing for all ages. Esparto, the festival headquarters, will hold festivities in Community Park with crafters, tastings, book sales, children’s activities, and live music all day. The big car show will feature more than 100 classic automobiles and pick-up trucks. In the morning you can enjoy a pancake breakfast at Esparto High School, and later see who wins top honors in the Almond Baking Contest. In Capay, enjoy live music on the patio at Road Trip Bar & Grill, or check out the motorcycles at Capay Junction, a popular spot for bikers. Over in Brooks, sample local olive oils and wines or grab a bite to eat at Seka Hills Olive Mill, where live music and entertainment will run all day long. Across the road, Capay Valley Vineyards will also offer wine tastings. Indulge your sweet tooth in Guinda, where you’ll find delicious homemade sweets, ice cream and almond rocha at the Western Yolo Grange. Check out the petting zoo, craft vendors and vintage engine and tractor shows while you’re there. Down the street, the Commons Farm Kitchen + Bar will be cooking up a slow-cooked southern BBQ menu complete with beer, hard cider and live music. A quick jump over Highway 16 and you’ll discover the Capay Valley Firefighters Association serving up BBQ oysters, shrimp and sausages at the Guinda Fire Department. Lastly, in Rumsey, peruse the local art show, organic produce stands, silent auction, and special children’s area with hands-on farm activities and demonstrations. Local Bluegrass music will be performed from 12-4 p.m. Food-wise, you can’t go wrong with wood-fired pizza and pulled pork sandwiches. You can pick up a free festival passport in any of the five towns and get it stamped at each venue along the way for a chance to win a large basket of Capay Valley products and goodies. No need to stick around for the winners to be announced—prizes will be mailed after the festival’s end. For more information about the day’s events, contact the Esparto Regional Chamber of Commerce at (530) 787-3242.